This article was for the first time presented at the 2nd FIG Regional Conference for Africa and the Arab Countries “Urban-Rural Interrelationship for Sustainable Environment” in Marrakech, Morocco, December 2-5, 2003. 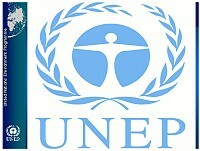 The United Nations Environment Program, UNEP, was established as a result of the first global meeting on Environmental issues that took place in Stockholm in 1972. For the first time the word Environment was put on the global agenda and discussed by a large number of heads of states. As a result, UNEP was established. We are, together with our sister organization Habitat that also is represented here at this conference, the only major UN organizations that are headquartered in a developing country, namely Nairobi, Kenya. 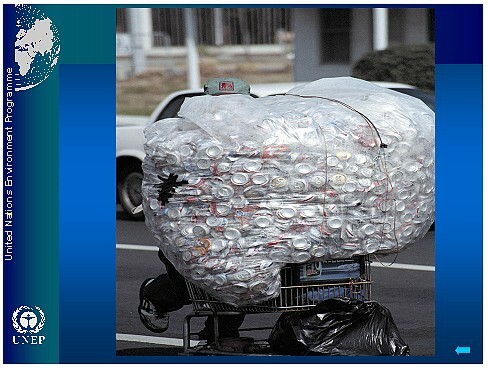 In my daily work I can assure you I am reminded of the major problems that occur in mega cities in developing countries. In our 30 years of existence UNEP has been working on documenting the status and trend of the global environment, make this understandable for decision makers, and made recommendations to all UN member states, on the policy that is needed to protect the Earth for future generations. 2. OUR MOTTO IS ENVIRONMENT FOR DEVELOPMENT! A lot has been achieved over these 30 years. More than 200 Multilateral Environmental Agreements has been established, many of them with the help of UNEP, to stop pollution, protect biodiversity, prevent land degradation and stop global warming. But unfortunately, despite all these positive efforts and achievements, the current policy is not strong enough. UNEP’s global state of the environment reports shows, with a few exceptions, that in most sectors and in most countries the development is not sustainable. Later this week I am attending the 9th Conference of the Parties of the Global Climate Convention in Milan. Climate Change is characterized by UNEP as the most severe environmental problem of this century. UNEP is urging the ratification of the Kyoto Protocol. But without the ratification of the US and Russia, even if most signatory countries have ratified, this protocol will not enter into force. With the staggering technological development and a 50% increase in the global human population since the meeting in Stockholm in 1972, we have witnessed an accelerated pace of change, seemingly beyond our control. We are placing in jeopardy many of the life-supporting systems on which we and our descendents depend. The galloping world-wide urbanization is one of the processes that more have happened than being planned. A driving force might be that in general, the income per head in a city is higher than in rural areas in the same country. City governments have realized the impacts of this urban expansion – not only environmental - but also social and economic. Policies were post-facto, to manage the effects of expansion more than the expansion itself. But gradually these policies have become more pro active. UNEP, on our side, has also been gradually more interested in the urbanization, and the urban-rural link, in a global sustainable development context. 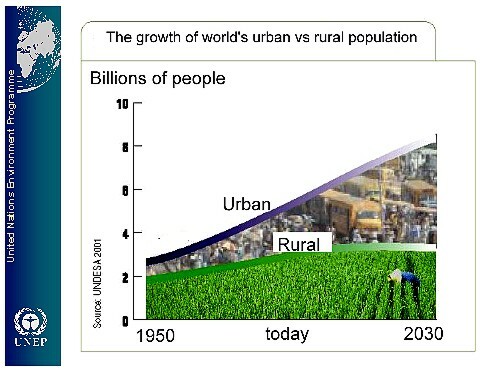 This slide shows the development and future projections of urbanization. While less than one third of the lived in cities in 1955, this will be two thirds in 2030. Developing countries are following the same trends as the developed in urbanization. But as urbanization in developing countries went hand in hand with economic growth and increased welfare, this is not the case with developing countries. One of the results is informal settlements, in itself a hindrance for proper development of the housing sector. Amongst the major issues is waste. 75% of solid waste in cities in developing countries are either left uncollected or disposed in open dumps. In the urban areas of the world, 675 million people are lacking access to sanitation and 619 million are lacking access to safe water. UN millennium goal is to half this figures by 2015. The issues of Water, Sanitation and Human Settlements is topping the agenda on the Global Meeting of Environment Ministers arranged by UNEP in The Republic of Korea in March 2004. It is also topping the agenda on the Commission of Sustainable Development when they meet to their 12th session in New York in April next year. But despite efforts and focus, with the current trends, the goals will not be achieved. The urban development and urban environment cannot be seen isolated from its surroundings. This slide shows the daily “environmental balance” of a European city of 1 million inhabitants. (read from slide). Cities generate pollution and environmental pressure. Some of the pollution stays within the city but much affects the rural areas surrounding the cities. 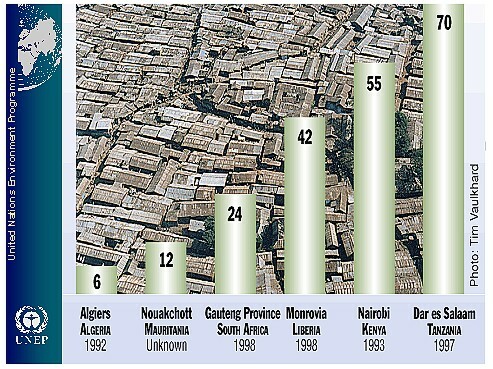 Cities can deplete natural resources such as forests, agriculture land, water, air, recreation areas etc. Let me say a few words about cities Environmental Footprints. Cities consume massive amounts of environmental goods and services – imported from ecosystems beyond their borders. 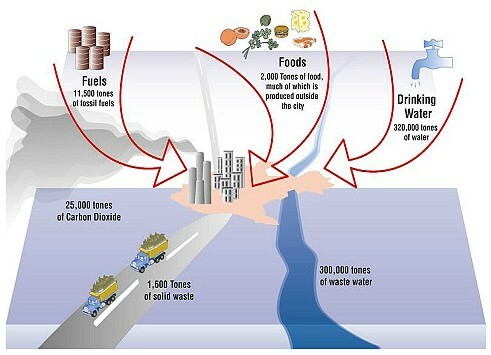 A city ecological footprint is the area of productive land and aquatic ecosystems required to produce the resources used, and to assimilate the wastes produced at a specific material standard of living, wherever that land may be located. The total productive capacity of the Earth is estimated at 11,4 billion hectares (slightly less than 25% of the surface is biological productive, the rest is desert, ice caps, deep oceans etc.). The global ecological footprint covered 13.7 billion hectares in 1999, or 2,3 hectares per person This is almost 20% above its theoretical capacity. This is one way of explaining what today is evident - the Earth has passed the status of sustainable development, meaning that we are leaving a steadily decreasing availability of natural resources for the future generations. The London Trust co-founder, Herbert Giradet, has estimated London’s footprint to approximately 21 million hectares, 125 times the surface area of the city itself, or equivalent to all productive land in UK. 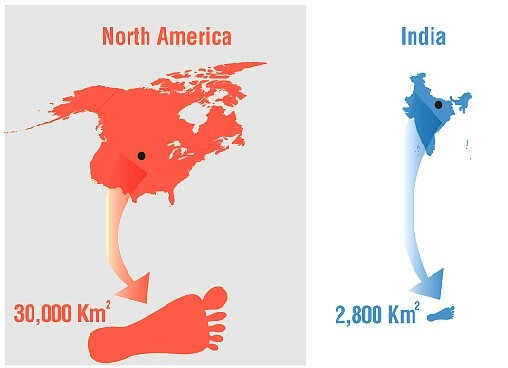 Other footprint studies show similar results. A study of 29 cities in the Baltic Sea drainage area showed in average a footprint 200 times larger than the cities themselves. It is important to explain that high income groups contribute disproportional to these footprints. A slum dweller in New Delhi require only 0.8 hectares of land to maintain their minimal lifestyles, while Americans in Boston or New York need 8.4 hectares to support their consumption levels. The major challenge Sustainable Development faces today can be formulated in the following two questions formulated by UNEP’s Executive Director Klaus Toepfer in UNEP’s annual report 2001: How can we alleviate the poverty of the majority without encouraging a massive increase in unsustainable consumption? – and: How can we curb the excessive consumption of the minority without harming the lifestyle that depend on that consumption? In the face of the rapidly deterioration of our natural resource base, these are issues the world needs to tackle. And these are the issues that UNEP is working to address. Given the known trend of urbanization, UNEP argues that urban and rural development cannot be seen isolated or conflicting. To achieve sustainable development the Ecosystem Approach might be used on the cities and its hinterland. The Ecosystem Approach is a strategy for integrated management of land, water and living resources that promotes conservation and sustainable use in an equitable way. Cities are finding that cooperation with the hinterland in protecting watersheds that are used to produce drinking water for the city, is more efficient and costs less than increasing investments in water filtration. The city of New York has plans to buy land upstate to protect the watersheds that are used for producing the city’s drinking water. This is part of a watershed protection strategy that will cost 1.4 billion USD but is estimated to save the city from having to spend 3 to 8 billion for new filtration systems. Increasingly this important dependency between rural productivity and urban consumption is better understood. However, cities are not only consuming what rural areas are producing, cities are also adding a lot in the urban-rural interdependence. Cities provide facilities services and jobs, and cities have always been the driving force behind rural development. It is therefore crucial to analyze the urban environment impacts of urbanization in the context of interdependent urban-rural systems. Mr Chairman, I could not address a distinguished audience of fellow surveyors without showing a map. This metamorphic, or poor-rich projection of the world, produced by UNEP’s GRID center in Arendal, Norway, is illustrating without the need for more words the challenge the world faces today. 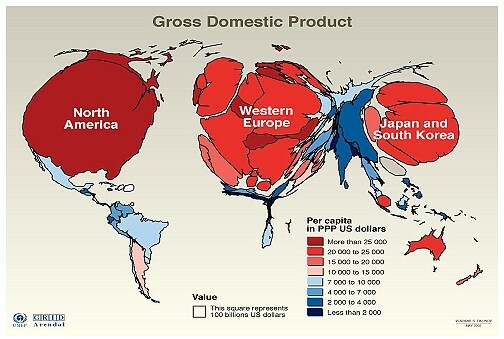 A GNP map of the worlds cities would give exactly the same result. We have to change this into a normal map to make sustainable development for future generations a reality. Current policy is not sufficient to turn the trend. The FIG president mentioned in his speech yesterday that “FIG and its member associations could be both enablers, mediators and advisors, and be strongly committed to continue its contribution in helping to achieve a better and more sustainable world in cities and countryside”. Mr. Chairman, fellow surveyors, UNEP will be happy to find practical ways to work with FIG to achieve these very important objectives.